This is already the sixth ‘volume’ in the ‘series’ of journals published by Numen Books (formerly Primordial Traditions). As the title says we are looking at Greece this time. 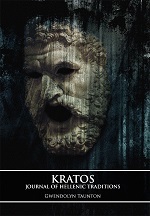 “Kratos” comes as a nice sleeve and with 242 pages, it is again quite a book. There are three texts of our productive editor an article of the editor of “Occult Traditions” and some Greek and less Greek sounding names. Some texts are very historical and of course there is a lot of Nietzsche. I must admit that the Hellenic tradition is not entirely my thing and I did not really enjoy all texts, but a very nice article is called “Hellenic Household Worship”. In this text Christos Pandion Panopoulos tells us about household religion in the past and the present. Another essay that hints to our own day and time is “Foreign Gods, Syncretism and Hellenismos” by Kallistos, telling us that many of the major Gods are not originally Greek. What is slightly remarkable is that some authors seem to take it that their readers can read Greek. Some sometimes give a translation or just a transliteration (but at other times nothing at all), but John Pickard manages to give a half-page quote in Greek and just starts to refer to it. Perhaps for me personally not the most interesting ‘volume’ in the series, but as always this Numen Books release brings together historical investigations and contemporary religion and comes with not the most common approaches, so I suppose that when you enjoyed the other books of Numen Books, you also want to get your hands on this latest publication (click on the “tag” below the title to read all reviews).